Malaysia Airlines Flight MH370 Satellite Images - March 26, 2014 (Full Statement) - Balita Boss! New satellite images have spotted 122 objects floating in the southern Indian Ocean that could possibly be debris from missing Malaysia Airlines Flight MH370. 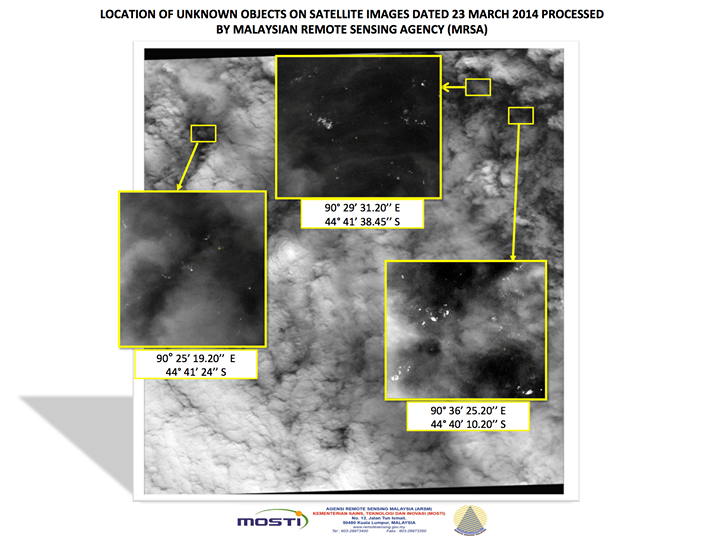 The images above, from French-based Airbus Defence and Space, dated March 23, 2014 processed by the Malaysian Remote Sensing Agency (MRSA) and released by the Malaysian government on March 26. "MRSA analysed the images and - in one area of the ocean measuring some 400 square kilometres - were able to identify 122 potential objects," Acting Transport Minister Hishamuddin Hussein said. The new images showed potential objects approximately 2,557 km from Perth, Australia in the southern Indian Ocean and ranged from 1 meter to 23 meters in sizes. “Some of the objects appeared to be bright, possibly indicating solid materials,” the acting minister told reporters. The Malaysia Airlines Boeing 777 (Flight MH370) disappeared on March 8. The search for MH370 continues. Our efforts are now focused in the southern Indian Ocean, where a multi-national team, led by Australia, is combing the waters trying to find debris from the flight. Our determination to find MH370 remains steadfast. As we have said all along, we will never give up trying to find the plane – in order to bring closure for the families, and to establish exactly what happened to MH370. Australia, China and France have already released satellite images, showing objects that may be related to MH370. Yesterday, on 25 March, the Malaysian Remote Sensing Agency (MRSA) received new satellite images from Airbus Defence and Space, which is based in France. The images were taken on 23 March. MRSA analysed the images and - in one area of the ocean measuring some 400 square kilometres - were able to identify 122 potential objects. Some objects were a metre in length; others were as much as 23 metres in length. Some of the objects appeared to be bright, possibly indicating solid materials. The objects were located approximately 2,557 kilometres from Perth. We will issue handouts relating to this new information, after this press conference. MRSA’s findings were immediately forwarded to the Australian Rescue Co-ordination Centre in Perth yesterday. 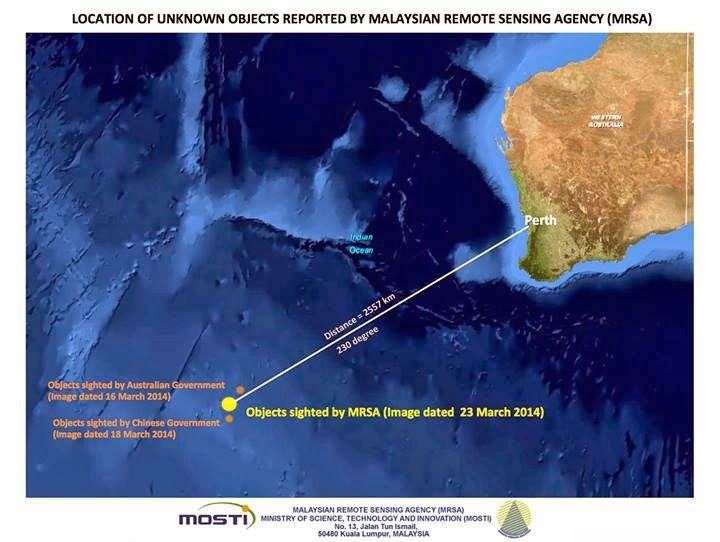 It must be emphasized that we cannot tell whether the potential objects are from MH370. Nevertheless, this is another new lead that will help direct the search operation. We have now had four separate satellite leads, from Australia, China and France, showing possible debris. It is now imperative that we link the debris to MH370. This will enable us to further reduce the search area, and locate more debris from the plane. Australia is leading the search effort in the southern Indian Ocean, based out of Perth. Malaysia continues to play a co-ordinating role. All countries involved are displaying unprecedented levels of co-operation; that has not changed. Australia has divided the search area into two sectors, East and West. Today the weather has improved, and twelve planes will travel to the search area – six in the East sector and six in the West. · one Australian P3 Orion, and three Australian civilian aircraft. · one Chinese Ilyushin IL-76. · one New Zealand P3 Orion. · one US P8 Poseidon. · one Korean P3 Orion. · one Japanese P3 Orion. · two Australian P3 Orions, and one civilian aircraft. Two ships will also join the search operations. Yesterday ‘HMAS Success’ was redeployed to the south of the search area due to bad weather. Today the ship has returned and will support the search operation in the West sector. Meanwhile, the Chinese ship ‘Xue Long’ has today been deployed to the East sector. A Japanese Coast Guard gulfstream aircraft left Subang this morning for Perth, to join the search operation. As I mentioned yesterday, the search operations in the northern corridor, and in the northern part of the southern corridor, have been called off. The Ministry of Foreign Affairs has sent diplomatic notes to all relevant countries to formally inform them of this change. Before I continue, I would like to convey our appreciation to the Australian authorities, and in particular to Prime Minister Tony Abbot, for making such an extraordinary contribution to the search operation. Today, the Prime Minister met with His Excellency Zhang Yesui, the Chinese Vice Minister of Foreign Affairs and Special Envoy of the Government of China. I also met with His Excellency this afternoon. During our conversation His Excellency conveyed China’s commitment to continue and intensify the search operation in any way possible, and to deploy any assets that may be required. Malaysia has provided his His Excellency and his delegation with a full update on the latest information from Inmarsat. His Excellency and his delegation also received a comprehensive briefing from the international technical team. As I mentioned yesterday, based on the new information provided by Inmarsat, we have established an international working group. The agencies involved in this working group include: Inmarsat, AAIB, the Chinese CAAC and AAID, NTSB, FAA, Boeing and Rolls Royce, as well as the relevant Malaysian authorities. The role of the working group is to help try and refine the Inmarsat data and, if possible, more accurately determine the final position of MH370. I should like to note that the CEO of Malindo Airlines, Chandran Rama Murthy, has joined me on stage today, and will be able to answer any questions that you might have. As I announced yesterday, MAS is now taking a lead in communicating with the families and is conducting their own press conferences. MAS will hold another press conference tomorrow. New satellite images continue to provide clues in the search for MH370. And with improved weather conditions, aircraft are now able to investigate objects of interest. I would like to thank once again our international partners for their continued support and assistance. The search for MH370, and the investigation into what happened on board the flight, is now a truly international effort.